Sea Ray has been building boats since 1959, when Cornelius Ray III started the business in Oxford, Mich. It is also one of the first U.S. builders to produce fiberglass boats. By 1986, when Sea Ray was acquired by Brunswick, its 4,500 employees were building 28,000 boats a year. 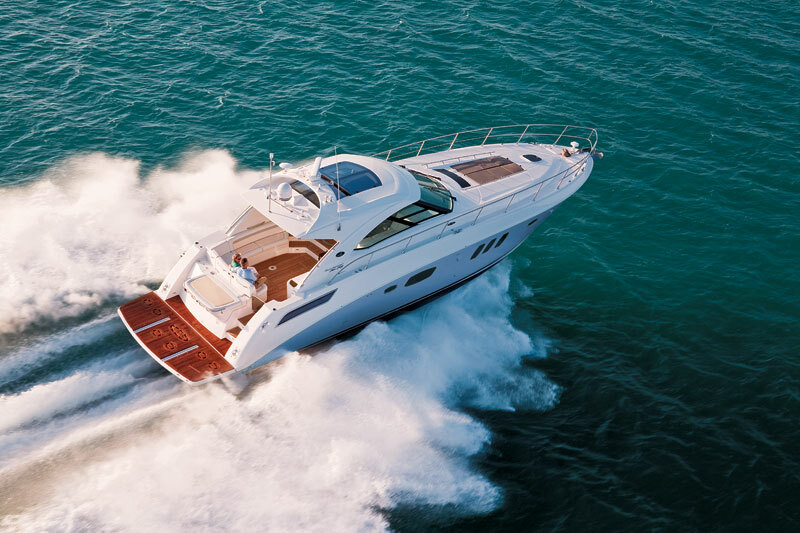 With that kind of history and experience, it is no wonder that the fiberglass work on our test boat — the new Sea Ray 540 Sundancer — is excellent. The hull is perfectly fair with no gelcoat haze or print-through, which is no small feat when you consider that imperfections are almost impossible to hide on a dark-blue hull like that of our test boat. Sea Ray made sure the new Sundancer is smartly styled in a modern manner, with elegant flowing lines and plenty of window glass. Access to the vessel is via an integrated swim step, complete with a concealed stainless steel swim ladder, perfectly positioned so that it’s a safe, easy step from most docks. This is important if small children or aging parents are part of the crew. The helm station on our test boat is a couple of steps up and forward from the swim step and fully open aft. This means there is easy access to, and superb visibility from, the double helm seats. The 540 has redefined what the aft end of a motoryacht should look like for boating families who are heavily involved in watersports. The swim step and cockpit soles are nonskid teak for extra grip, once again taking into account that watersports are sure to get the deck wet. 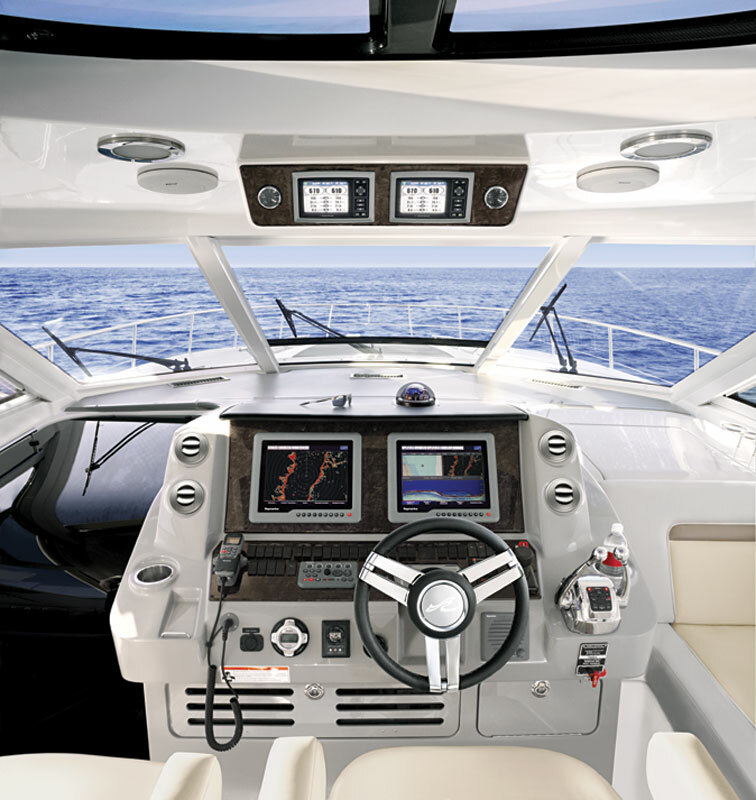 A fiberglass hardtop, with a retractable sunroof and overhead lighting, protects the helm station. The overhead lighting comes with an electronic dimming system, to set the mood when appropriate. In the cockpit is a wet bar with a sink, a faucet and solid countertops, plus an excellent sound system with a satellite radio and an antenna. A well-finished wood table allows for plenty of dining space in the cockpit or provides a suitable setup for a veritable buffet. The cockpit is also equipped with an aft sunpad and a comfortable lounge starboard of the helm chairs. To ensure plenty of sun-worshiping space, the foredeck comes with a standard sunpad, the base of which can be adjusted to a sitting position. It also includes built-in rails and drink holders. All shore-power outlets are GFI protected. The door to the vessel’s interior is to port of the helm station. 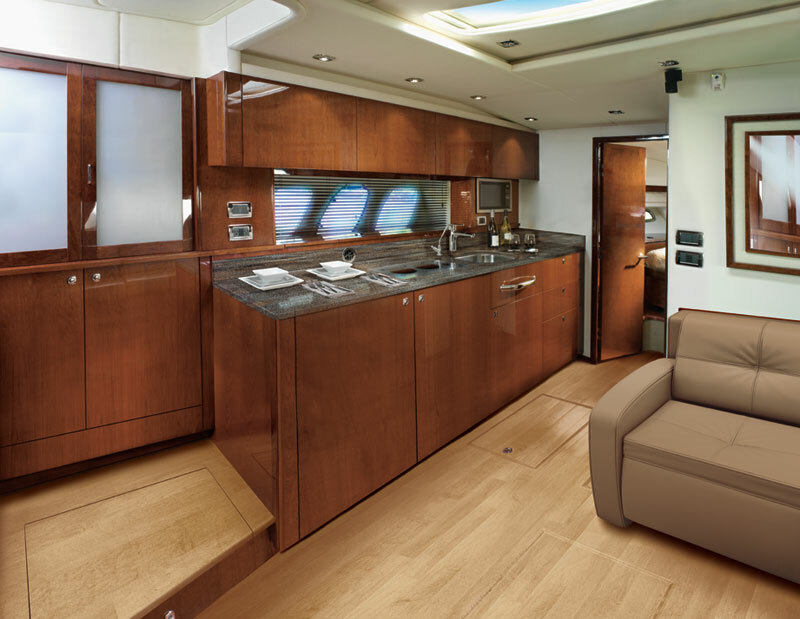 The galley and salon, which are open to each other, are flooded with natural light through overhead hatches and built-in hull windows. A stone galley countertop forward and along the port side is longer than similar countertops on larger vessels. It contains a stainless sink with a modern single-lever control and a pull-out spray faucet. The sink cutout is fully finished and drops flush into the sink, creating a solid, level, full-length counter, useful for preparing a large meal or laying out a buffet for 10. 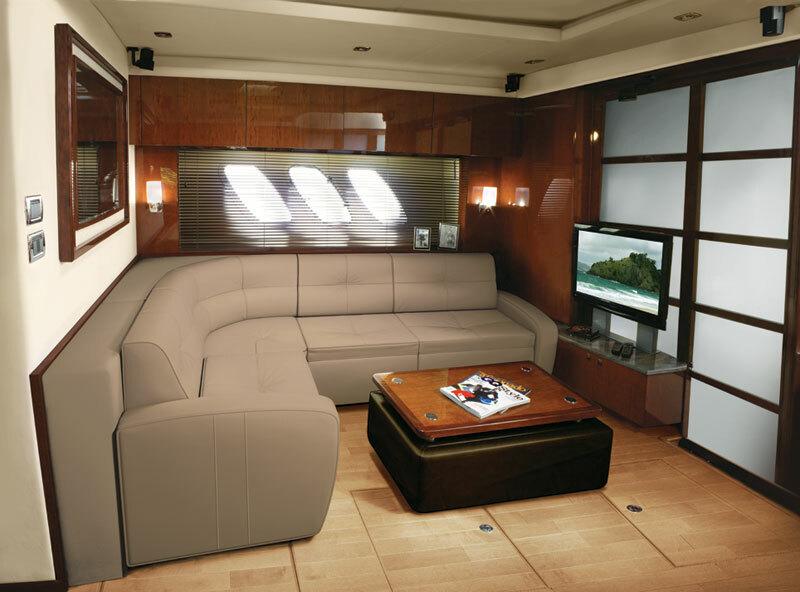 The salon contains a home-style theater sound system, a 32-inch flat-screen TV and an L-shaped sofa that converts to a berth. All interior flooring is wood. Overall, the interior of this new Sea Ray is well thought out, modern in style and color, and contains first-class equipment and fittings. 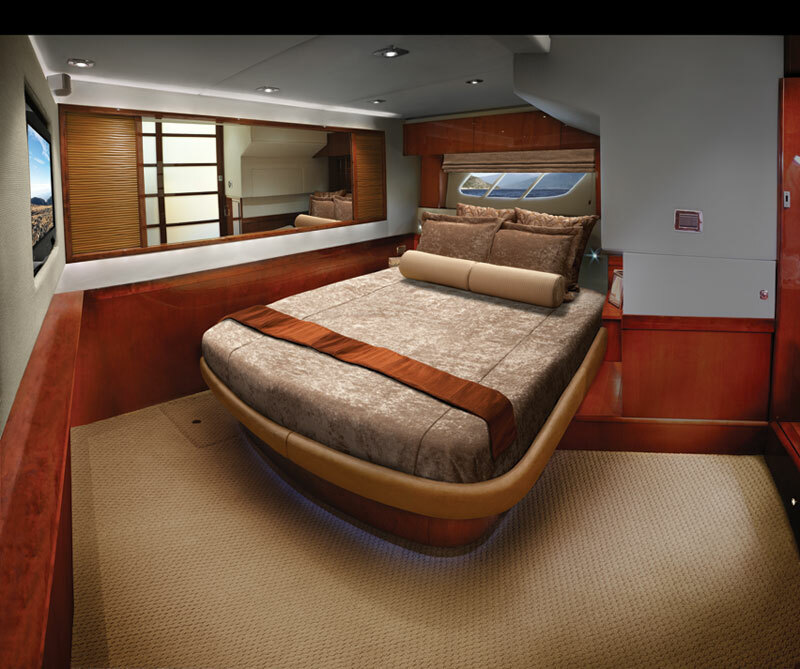 It has excellent creature comforts and the convenient touches one would expect in a family motoryacht. A three-stateroom version can be ordered. Our test 540 is powered by twin Cummins MerCruiser QSM11 diesels — the higher-powered option — spinning Zeus pod drives. With a member of the M&P Mercury (mpmercury.com) staff at the helm, we fired up the 661-cubic-inch (10.8L) engines. They flashed up quickly and easily from a cold start, with no smoke or rattle, and warmed up quickly. We moved away from the dock easily with the help of the joystick control. The vessel is not equipped with either a bow or stern thruster, but the computer-controlled pod drives make them unnecessary. The vessel’s control was precise in all maneuvering situations as we threaded our way through the very crowded Vancouver marina into the busy Vancouver harbor. As we moved along at idle, about 700 rpm, we made 5.7 knots, burned 8.6 gph per engine and threw no discernible wake. The low-wake feature is useful when navigating in waters with speed restrictions. Wide-open throttle gave us about 31 mph with a total fuel burn of about 68 gph. A good cruising speed was 23 mph at a fuel burn of about 40 gph. Where the 540 really shines in its handling. 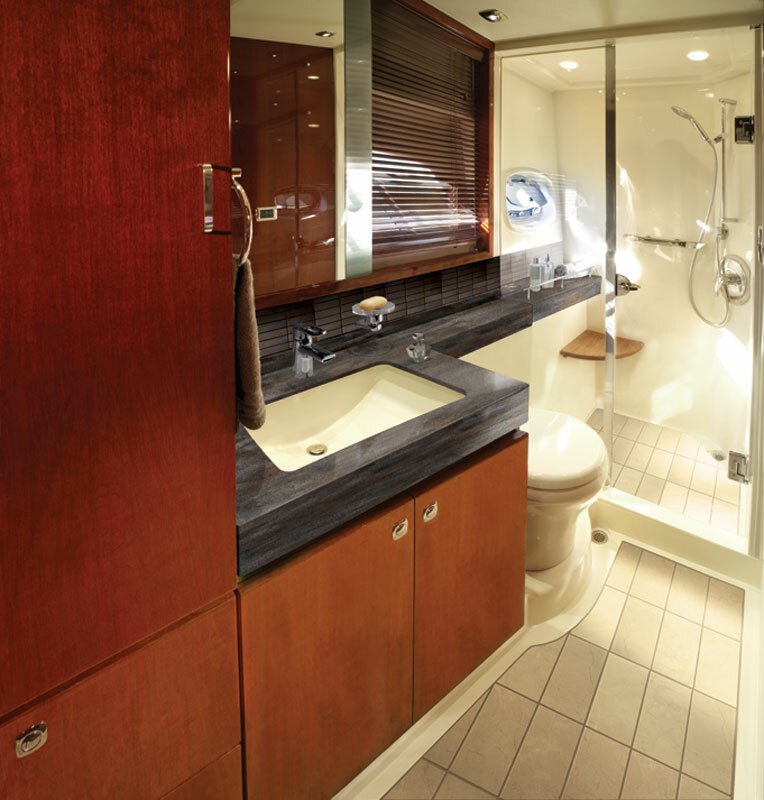 The solid glass hull has a 21-degree deadrise at the transom. The original Ray Hunt deep-V had a 22-degree deadrise, so the new 540 is, for all intents and purposes, a deep-V. Due to that configuration, the vessel should handle rough water with ease, and we found that to be the case during our wave-hopping ride. The Sundancer handled sharp turns very well, banking into them at such an angle that loose items on flat surfaces did not move. Even during lock-to-lock turns at full speed, the vessel did not bog down. 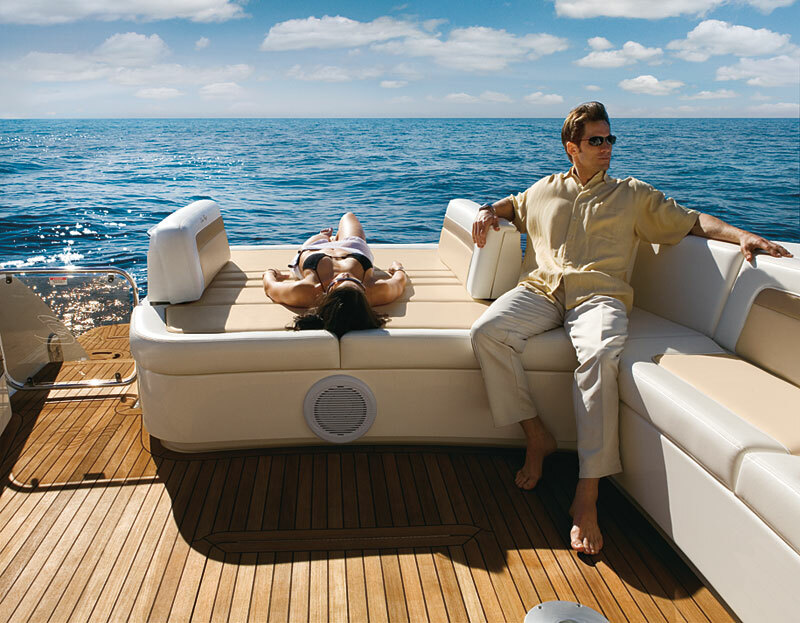 It handled more like a sportboat than a motor­yacht, responding smartly to all command inputs. Part of the reason for that is the excellent match between engine and drive. However, the Sea Ray hull design also has a lot to do with it. As we approached open water, we slid the throttles forward, and the twin 715 hp diesels pushed the 540 on plane very quickly and very quietly at about 12 knots, which is excellent performance for a deep-V hull. During our entire test, we were easily able to communicate with each other without shouting. This is no mean feat, since the aft of the helm station was wide open, with not even the canvas in place. LOA 54 ft., 9 in. Beam 15 ft., 3 in. Draft (INBOARDS) 4 ft., 2 in. Twin Cummins MerCruiser QSC8.3-600 DTS w/Skyhook, Zeus joystick control, SmartCraft Digital Throttle & Shift, SmartCraft VesselView display, salon entertainment center, coffeemaker, microwave/convection oven, under-counter refrigerator, two-burner stove w/pop-up retainers, autopilot, Raymarine E120 wide-screen primary and auxiliary displays, 21.5 kw Onan diesel generator, hydraulic trim tabs, fiberglass hardtop w/retractable sunroof, ice-maker, twin helm seats w/armrests and reclining backrests, choice of cherry, walnut or rift oak interior wood and more. Twin Cummins MerCruiser QSM11-715 w/Skyhook, FLIR thermal imaging camera, Raymarine G150 15-inch primary and auxiliary displays, three-stateroom layout option, colored hull (black, blue, champagne, horizon or patina), DSS Satellite TV system, teak soles and decks, barbecue grill w/built-in fiberglass lid, inverter, underwater lights at transom, hydraulic Marine Lift swim platform w/remote and manual pump, drawer-style refrigerator in cockpit, washer/dryer combo, windlass and more. 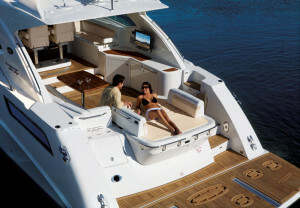 Visit searay.com to find the Sea Ray dealer near you.